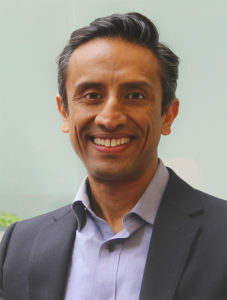 Chief Marketer recently chatted with Rishi Dave, recently appointed CMO of Vonage, about the challenges and opportunities facing his brand in 2019. Dave, the former CMO of Dun & Bradstreet, is tasked with raising the profile of the brand, which has shifted gears in recent years, transforming from a residential phone company into a B2B provider of enterprise-grade cloud communications software. CHIEF MARKETER: What are the major pain points and challenges when it comes to setting up a marketing strategy for Vonage? RISHI DAVE: The biggest opportunity is telling the story of who we are today, the portfolio we have assembled and why it matters to customers and prospects. There’s been tremendous transformation in the last few years, a lot through organic growth and M&A. Now, how do we articulate that [change] to the world? CM: Who is your main target audience? DAVE: It depends on the solution. We definitely go after small- to medium-sized businesses. And we’re also, with our API platform, seeing success with developers, digitally native companies and companies that are going through a digital transformation. CIOs and heads of IT are also a [target], and increasingly, we’re talking more to marketers and CX leaders who want to build communications experiences with customers. CM: What are the best channels to reach these buyers? DAVE: We take an omnichannel approach. Obviously, digital is a big channel and physical events are still very successful for us. With developers, it’s important to be there as a resource and be present in online communities where they hang out and at events where they network, to develop relationships. CM: How do you get audiences to engage? What type of content resonates with them? DAVE: Thought leadership is big. We have to address their concerns, and talk to the market about the future of how communications is evolving and driving business outcomes. A lot of our content addresses both developers and decision makers. For developers we obviously do more technical content to address questions they might have on working with our APIs and how to code them. CM: What are the biggest growth opportunities for Vonage? DAVE: For us, it’s about driving the next level of communications, and understanding your customer and their journey, to create an experience that integrates with your business. When a customer goes to different channels, it should be one experience and not disjointed. No matter what channel your customer uses, it should be a singular experience. CM: Is marketing attribution and data management a challenge? DAVE: Always. As much as possible, we try to test and learn and see what moves the needle and contributes to pipeline. We need to balance being overly analytical with being over simplistic and avoid making the wrong decision. Today, we all have so much data, and you need to drive strategy by [determining] what is the right data [for your marketing plans], and then integrating it into your CRM, getting insight, and leveraging analytical models.